■ Briefly press program selector button 1. The letter M appears in the multifunction display. The manual drive program M is activated. ■ Press program selector button 1 repeatedly until the letter for the desired gearshift program appears in the multifunction display. 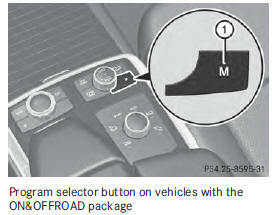 The program selector button allows you to choose between different driving characteristics. : the automatic transmission switches to automatic drive program C each time the engine is started. Drive program M is not saved after the engine has been switched off. If required, you must select the drive program again after starting the engine. In the manual drive program you can change gears manually using steering wheel paddle shifters 1 and 2 .